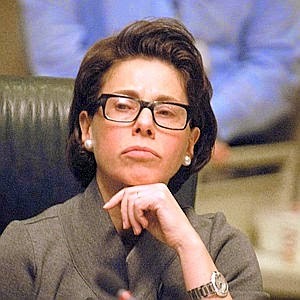 Thank goodness we have great thinkers like Merryl Tisch working for us. If it weren't for her, teachers would still be grading Regents exams of their own students. Back in the bad old days, that would translate into rampant corruption. Sometimes, in fact, a bunch of evil teachers would look at a grade of 64 and try to find ways to make it a 65. Obviously that's unacceptable. It's vital that any kid with a grade of 64 be forced to go to summer school, or take another year of that course, or whatever it takes to learn that this is a rigorous world. Because this world is not about curiosity or joy, but rather rigor and grit (unless your father is Andrew Cuomo, Bill Gates, Barack Obama or John King, but that's another story). In public schools, we let kids know life is filled with tedium and unnecessary nonsense. Otherwise, how will we persuade people to make careers at Walmart? Since Merryl Tisch has determined that public school teachers are a bunch of lowlife animals, unworthy of the public trust, we can't allow their favoritism to sully our practice of giving kids grades of 64. We've placed incredible pressure on teachers to have their kids pass tests, and it's important that we preclude their giving any comfort or aid to the kids they work with. Again, it's kibbles and bits. Or rigor and grit. Or something we need to teach the kids who don't go to Montessori schools, like John King's kids. In NYC, we've taken this thinking to a whole new level. One year, we took all the papers to Connecticut or someplace, and teachers couldn't even touch the physical papers. Unfortunately, some of them fell off the truck or something before we could scan them. I guess that meant more rigor and bits for the kids who just had to take the test again. Now it's different. Before, city teachers would sit and grade papers. Now, they travel to other schools and do it. But for some reason, it just doesn't get done on school time. Therefore we now pay teachers to grade the papers of kids from other schools. How much? Who knows? But friends tell me they're offered all sorts of extra hours to do what used to get done on school time. I get emails from the DOE offering me hours if I'll go grade English Regents exams. I don't do it because I'm not at all interested in reading papers of strangers. But a lot of people need the money and they have no problem getting enough people to do it. Is that a good use of taxpayer money? I'm a taxpayer, and I don't think so. Why should we pay extra just to make sure more kids fail? I'm really curious why not one education writer has even noticed this. It would make a great story if some enterprising writer could find out how much extra money the city pays in per-session in order to maintain this idiotic policy. But I guess with Campbell Brown out attacking tenure as the civil rights issue of our time, there just isn't enough space.